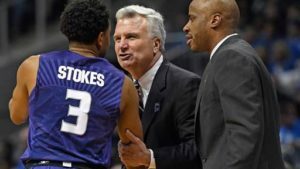 MANHATTAN, Kan. – Kansas State men’s basketball coach Bruce Weber was among seven individuals selected to the Southern Illinois Athletics Hall of Fame on Tuesday (June 13) by university officials. Weber, who led the Salukis to 103 wins and consecutive NCAA Tournaments as head coach from 1998 to 2003, will be formally inducted into the university’s Hall of Fame on Friday, October 19. He will be joined in the Hall of Fame class by former player Jermaine Dearman, along with Mallory Duran-Sellers (softball), P.J. Finigan (baseball), George Loukas(football), Jeneva McCall (track and field) and Bryan Mullins (men’s basketball). The architect of the SIU’s basketball resurgence in the early 2000s, Weber inherited a program that had posted three consecutive losing seasons and quickly turned them into a force in the Missouri Valley Conference. He led the Salukis to a 103-54 (.656) overall record from 1998 to 2003, which included back-to-back Missouri Valley Conference regular-season titles and NCAA Tournament appearances in 2002 and 2003. Named head coach in 1998, Weber led the Salukis to their first winning season in four years with a 15-12 record in 1998-99. He followed with the school’s first 20-win season since 1994-95 in year two, which included a trip to the 2000 NIT and its first postseason victory in four years with a 94-92 win at Colorado. Weber’s teams were a combined 52-15 (.776) in his last two seasons (2001-03), including consecutive MVC regular-season titles and NCAA Tournament appearances. His 2001-02 squad collected 28 wins, including 14 in league play, and made a run to the Sweet 16. He once again led the Salukis to the NCAA Tournament in 2002-03, where his team tallied 24 wins, including an impressive 16-2 mark in MVC play. Weber is set to begin his seventh season at K-State in 2018-19, recently agreeing to a contract extension through the 2022-23 season after guiding the Wildcats to their first NCAA Elite Eight in eight seasons. He has posted a 125-80 (.610) overall record that includes four NCAA Tournament appearances. His 125 wins are the fourth-most by a head coach in school history and the most since Jack Hartman retired as the school’s winningest coach in 1986. Weber, 61, has compiled a 438-235 (.651) record in his 20 seasons as a head coach, which includes stints at Southern Illinois, Illinois (2003-11) and now K-State. His .651 winning percentage ranks 37th among active Division I head coaches, while he is the 41st coach (21st active coach) in NCAA history to take three different schools to the NCAA Tournament. Weber’s teams have participated in postseason play in 14 of his 20 seasons, including 12 NCAA Tournament appearances. He has averaged 21.9 victories a season in his head coaching career.